Saving For Your Future » Investing » Moneyfarm Review – are they the right investment for you? Moneyfarm Review – are they the right investment for you? 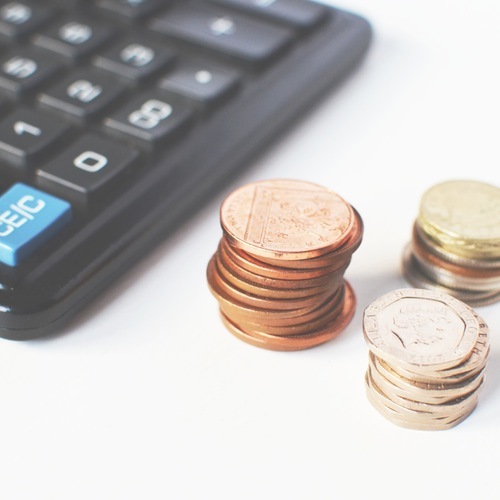 In this independent Moneyfarm review I look at how Moneyfarm invests money, Moneyfarm's charges and fees as well as Moneyfarm's performance and portfolio returns. As one of the most widely quoted investment experts in the national press I walk you through my review of Moneyfarm in stages. I suggest you read the entire review as it includes key observations and analysis of Moneyfarm's proposition, particularly around charges and performance. If you want to jump to specific parts of this review then you can do so by clicking on the links below. I also want to make you aware that the quick answer is that I feel Moneyfarm investments may be suitable for some readers (read full review) and I therefore secured an exclusive offer for MoneytotheMasses.com readers that means they will get half price management fees on their ISA for the first 12 months. Not only that but everyone who uses this offer will also get a free portfolio consultation and a dedicated investment consultant. None of Moneyfarm's competitors provide such an offer. In the interests of transparency I receive a small fee from Moneyfarm if you utilise the offer. However editorial independence is paramount to Moneytothemasses.com and in no way is this review or my views ever influenced by 3rd parties. I have included a link to Moneyfarm at the foot of this article which you can use and MoneytotheMasses.com will not receive any payment from your referral. How do Moneyfarm manage their portfolios? The best DIY Investment ISA or pension? Moneyfarm is an interesting proposition for those trying to find the best DIY investment ISA or pension to invest in. After successfully running money for DIY investors in Italy since 2011, Moneyfarm launched in the UK back in 2016 following the rise in demand for DIY investment ISAs, robo-advice, cheap stocks and shares ISAs and pensions for beginners. That's because historically investing was the preserve of the wealthy but the rise of investment fund platforms changed that. The UK market has since been looking for a cost-effective investment platform for beginners (and experienced investors) that can deliver good investment performance with minimal input from the investor. However, most fund platforms and their stocks and shares ISA products and pension plans tend to have high minimum investment amounts. Historically Moneyfarm used to allow you to invest from as little as £1. However, it has since raised this minimum to £500, in line with other robo-advisers such as Nutmeg, which is the closest comparable alternative to Moneyfarm out there. 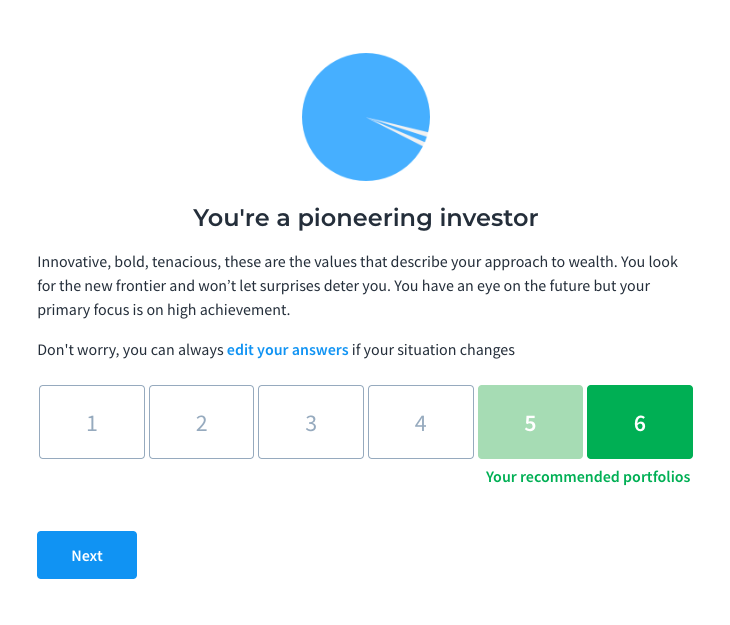 If you want to invest less than £500 have a look at our Wealthsimple review, which lets you invest from as little as £1 in an ISA or general investment account, but it does not yet have a pension product. All of the above should also be true of any pension product you choose and Moneyfarm can do all of this within 10 minutes and can help you invest your ISA allowance or start a pension via a slick online interface or via the Moneyfarm app, This is quite an achievement compared to other investment platforms where the user experience is far clunkier. Having said that rather than take Moneyfarm at their word I actually tested this 10 minute claim and in fairness it does hold true. In fact you can just have a dummy Moneyfarm portfolio created for you, with no compulsion to invest, in about 3 minutes. One important distinction between Moneyfarm and some other robo-advice firms is that it actually recommends a portfolio for you. 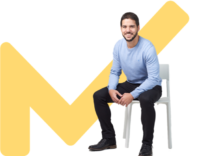 Moneyfarm offers regulated advice to consumers and so its customers are afforded the greater level of consumer protection that comes with regulated advice over that which execution-only robo-advice propositions provide. How does Moneyfarm investment management work? You can also transfer existing pensions into it - which Moneyfarm will help you do. MoneytotheMasses.com readers can also take advantage of our exclusive offer where Moneyfarm will give you a free bonus of up to £100 when you sign-up for a Moneyfarm pension, or transfer an existing pension to them. If you take advantage of this offer you will also receive a free investment review as well as a named investment consultant. This last part was specified by me as part of the offer as we wanted a more personal service to be provided to consumers. How does Moneyfarm manage its portfolios? Over the course of the past few years I have held a number of meetings with Moneyfarm in order to assess how they invest money, including a meeting with Richard Flax, their Chief Investment Officer who is in charge of the investment team. I've also anonymously opened an account with them online. Moneyfarm initially assesses your risk profile using its own in-house risk assessment, as opposed to an external third party offering such as Finametica. The screenshot's below are the summary of the questionnaire and the answers that I gave when registering (click to enlarge). Once you've answered the questionnaire you will be presented with the following screen that will give you your recommended portfolios, one in dark green and others in lighter green (The darker green being the favourable recommendation based on your answers). At this stage, Moneyfarm used to present the breakdown of the corresponding portfolios on screen but you are now encouraged to continue to a full registration. 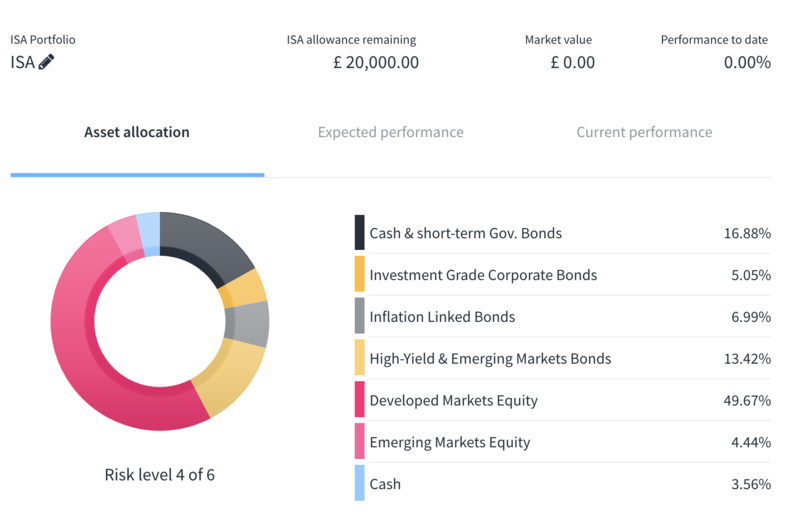 If you are interested in seeing the asset allocation of your recommended portfolio then you can simply check this on Moneyfarm's website, as it is easily accessible information. It is important to highlight at this point that this is an actual recommendation, or in other words, Moneyfarm is providing you with regulated advice on the suitability of the portfolio it recommends. This distinction is important as some robo-advice firms operate on an execution only basis, which means you ultimately select the portfolio to invest in and all the risk lies with you. Because Moneyfarm is making a formal recommendation the advice has to adhere to strict FCA guidelines. That means each year Moneyfarm reviews the suitability of your portfolio and recommends whether it remains suitable or whether you need to change portfolios (i.e. to take more or less investment risk). This recommendation is based upon any changes in your profile. The asset mix of your portfolio takes into account your risk profile, the amount you plan to invest and how long you wish to invest for. You may also have the choice of taking less or more risk than your recommended portfolio's default position. If you opt to take more or less risk then it alters the portfolio asset mix. Moneyfarm's portfolio asset allocations are based upon volatility targeting for each level of risk. Volatility is a measure of how quickly markets or an asset move up and down. This is slightly different to risk. To help understand this think of volatility as like the waves in a stormy sea while risk is the event that you drown. They are two different things. Yet clearly as volatility increases the risk rises. There is a lot of debate about whether volatility is a good measure for assessing risk. However I have carried out extensive research as part of my DIY investment service 80-20 Investor which shows that it is a valid tool for managing risk. By contrast most investment platforms assess risk based on generic assumptions i.e that all bond funds are low risk. Yet that view is flawed. Ask anyone who lost a sizeable amount of money when the bond market sold off at the end of 2016 whether bond funds are low risk or not. The point is that risk is relative. So I view it as a big positive that volatility is part of Moneyfarm's risk management process. For each portfolio Moneyfarm targets volatility which means that if assets become more volatile then their place in the portfolio will be reviewed. So theoretically a low risk portfolio should remain low risk even if investment markets undergo a fundamental shift which alters the asset's risk level (as per the bond example above). On top of this Moneyfarm rebalances its portfolios (i.e. makes changes to make sure the asset allocation has not deviated from the desired mix as a result of market moves) roughly every 3 months. Again, this is a sensible period of time as it is short enough to ensure unwanted risks don't creep into the portfolios but long enough to avoid excessive costs from over-trading. One of my biggest criticisms of most managed Stocks and Shares ISA funds and pension funds is that the managers do not back their convictions. The best performing Stocks and Shares ISAs and pensions in the long term are those that do not simply track the market or just replicate their peers. To outperform you need to occasionally invest in unpopular assets or avoid others that are unattractive. Moneyfarm invests using ETFs which track a given index or asset price. 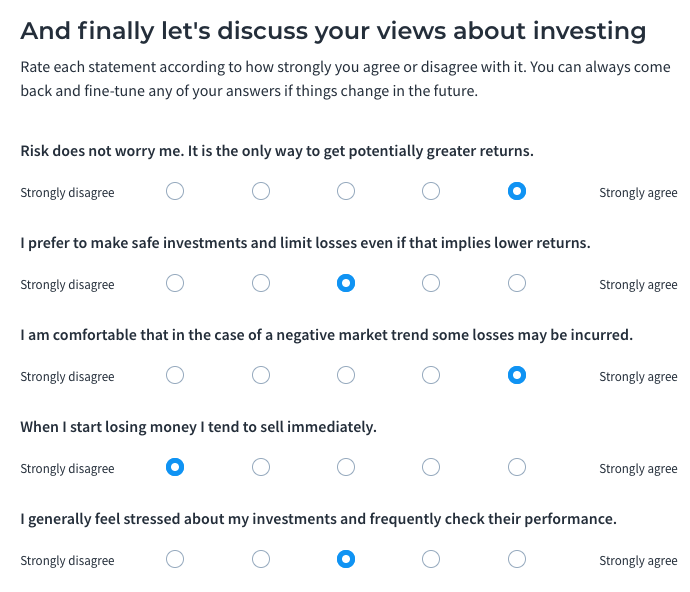 What became clear when grilling their investment analysts is that Moneyfarm will make investment decisions based on their research. For example, they have tended to avoid investing in commercial property (due to it being illiquid) which should have fared them well during 2016 when that market devalued in the wake of the Brexit vote. They have also previously avoided investing in commodities and have even used currency ETFs to hedge their currency exposure (as they did ahead of the Brexit vote). But this has now recently changed. Moneyfarm chose not to chase performance in the equity rally of 2017 by unnecessarily increasing the investment risk they were taking. This meant that their portfolios held up well in the subsequent stock market correction in the spring of 2018. This period in the stock market was interesting as a lot of robo-advice firms came under increased scrutiny. Some investors expected their robo-advice firms to react to the stock market sell-off in order to limit their loses. During this period Moneyfarm's investment committee did review the situation and concluded there was no need for a knee-jerk reaction, which proved the right call in the end. The point is that behind the scenes there is a lot of analysis and decision making going on, but it isn't communicated as well as it could be to clients. This is a criticism that could be levelled at most robo-advice firms. A decision to leave a portfolio unchanged is still a decision and should be relayed as such. Moneyfarm's investment process and risk management is refreshing and at least gives them the opportunity to outperform the market in the future. For me this is important and I'm not sure why Moneyfarm does not make reference to it externally. Many investment companies simply compete on price (i.e try and tempt consumers with claims of being the cheapest) at the expense of trying to maximise investment returns. That's far from desirable and you'd be better off just buying a simple tracker fund. As an aside, my advice to anyone investing using ETFs is to try and stick to physical ETFs if possible rather than synthetic or sampled ETFs. Physical ETFs actually buy the assets they track rather than use financial instruments to replicate the moves in the targeted asset's price. Sampled ETFs track the chosen index asset less closely than one that physically holds the asset in question. For example if you only buy shares in a sample of the companies that make up the FTSE 100 then your investment performance will differ from that of the index. Synthetic ETFs also introduce something called counterparty risk which means there is a potential for investment returns to not materialise. In short, if you are looking for a low cost Stocks and Shares ISA that invests in ETFs then go for one that favours physical ETFs. Moneyfarm is one such provider. However, since December 2017 Moneyfarm has started to use non-physical ETFs where necessary but it remains the exception rather than the rule. They certainly don't use leveraged ETFs (these are ETFs that amplify returns and losses by using borrowed money). They do manage currency risks by buying currency-hedged etfs where they deem it appropriate. The good news is that you can build a bespoke portfolio for free using Moneyfarm's portfolio tool without committing to the service. Registering is free and there is no obligation to contribute any money. 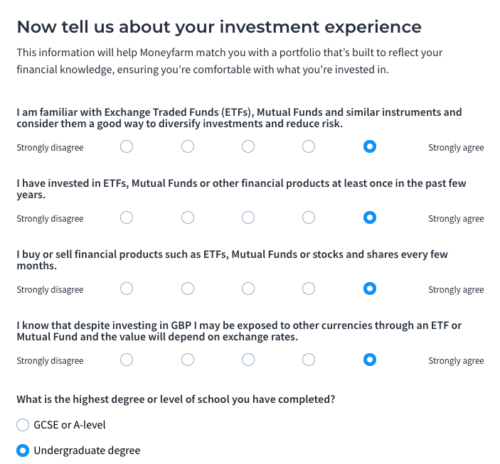 As the asset allocations for the portfolios change regularly I strongly suggest that you register and let the tool suggest a portfolio because the asset mix is dependent on how long you want to invest for as well as your risk profile (as determined by Moneyfarm's risk questionnaire). The image below shows you what you can expect to see. This level of transparency can only be a good thing. Below I've summarised how a typical Medium risk portfolio is currently invested assuming a five-year investment term. As I mentioned above, you can see a more personalised portfolio in less than five minutes by registering on the Moneyfarm site. The numbers in brackets were the portfolio positions at the start of 2017 to give you an idea of how Moneyfarm altered its asset allocation over time. Since I last updated this review back in August it is interesting to see that Moneyfarm is now investing in Commodities and Property, asset classes they have previously avoided. Perhaps more noteworthy is that depsite the equity market correction in the autumn of 2018 Moneyfarm has largely stuck to its guns in terms of equity exposure (it has altered it slightly) which means that it will have fared well in the market rebound at the start of 2019. Credit where credit is due. However, the only way to assess how successful a firm has been at investing money is by looking at the past performance. I analyse Moneyfarm's returns later in this article. Moneyfarm's charges are set out below. However you can get half price management fees on your ISA for the first 12 months. There is no other online Stock and Shares ISA provider that I am aware of that currently matches this. * In addition you will pay underlying fund costs currently at an average of 0.3% as Moneyfarm use passive investments known as exchange traded funds (ETFs). This is the cheapest way to invest as most funds run by fund managers (known as active funds) sold via major fund platforms have fund charges of between 1.5-2.5% which is on top of the fee charged by the investment platform. Moneyfarm's own research (which I haven't verified) suggests that they are almost 1.2% cheaper than investing via Hargreaves Lansdown, almost 3% cheaper than using a wealth manager and 4.8% cheaper than investing with a financial adviser. Personally I wouldn't overplay these figures but they are indicative. The main takeaway is that Moneyfarm is certainly a cheap way to invest. Moneyfarm has been investing money across Europe for a number of years and has a two and a half year track record of doing so in the UK. If you register with Moneyfarm (which doesn't mean you have to invest as you can just play with it for free) you can gain access to their latest UK performance data going back as far as January 2016 as well as their own projected future returns. The table below summarises Moneyfarm's performance from 1st January 2016 to date (i.e to February 2019) assuming you invested less than £50,000. To give this some context a typical pension or investment fund, available on other investment platforms, with a similar medium risk investment mix (also known as an active fund) returned 22.90% over the same period. That is considerably less than Moneyfarm's 25.2%. If you also compare Moneyfarm's investment performance with other passive investment solutions, such as the popular Vanguard Lifestrategy funds, they have performed well. If you consider the Moneyfarm performance versus the equivalent Vanguard Lifestrategy Equity fund then Moneyfarm's medium risk portfolio is on a par with the Vanguard equivalent. The difference is that Moneyfarm provides a human overlay to manage risk while Vanguard's proposition is purely passive and tracks the market. I don't mind admitting I was actually quite impressed with Moneyfarm's investment performance. Based on the figures above most investors would do well to outperform Moneyfarm using alternative means assuming they took the same level of investment risk. However there are few caveats to add, firstly the timeframe is 38 months so isn't exhaustive. Also investment markets at the start of 2016 plummeted yet the first few days of Moneyfarm's performance shows that they didn't lose any money. This may be purely down to their investment management but it is most probably indicative of them not being fully invested in the market after the portfolio's launch which therefore marginally boosts their performance figures. Having said that there is no denying that the performance is extremely good and they performed well across the Brexit vote and the stock and bond market wobbles following the US election in November. In fact their 2016 performance was superb, with their medium risk portfolio finishing the year up 18.20%. Compare that to the average active managed fund performance of 13.12% for 2016 and you can see why I'm impressed. However in 2017 Moneyfarm's performance, along with other tracker based propositions (such as Vanguard's), was less spectacular making 3.62% in the first nine months, slightly lagging actively managed funds. This reflects their more cautious approach in 2017 after such a strong equity rally so they didn't capture all of the upside. However, Moneyfarm did perform well across the market sell-off at the back of 2018 which is a feather in its cap. To sum up you will be hard pushed to find many passive or active investment proposition that has significantly outperformed Moneyfarm since they launched while managing risk in the same way. So Moneyfarm would get a tick in the investment performance box on any checklist. The table below compares the fees charged by Moneyfarm and Nutmeg on their managed portfolios. Interestingly Nutmeg reduced its management fees last year to those stated above in order to be comparable to Moneyfarm. However make sure you check Moneyfarm's charges list here. If we look at investment performance of Nutmeg vs Moneyfarm between 1st January 2016 to 1st January 2019 Moneyfarm absolutely trounces Nutemg as shown in the table below. As stated earlier the Moneyfarm performance data is accessible if you register an account. Clearly Moneyfarm has significantly outperformed Nutmeg. Who should consider Moneyfarm investments? Moneyfarm's portfolio performance has been strong, although this is not necessarily indicative of future returns obviously. However if you want a slick, low cost, easy way to invest with a potential for a decent return then Moneyfarm is certainly worth considering. On the other hand if you want to take a more hands-on investment approach which empowers you to make your own DIY investment and fund decisions then have a look at my 80-20 Investor service.